One of those mornings when, after dropping the kids off at school, you have a long ‘to do’ list and nevertheless you end up drinking coffee and chit-chatting with other mums at your local café. One of those mornings when, at the end, you feel lost and lonely because for one more time you realise you live in a ‘not home’ town and what’s worse you don’t know where is your home town anymore. One of those mornings when you still leave in a non-place where you exists as an expat and try hard to feel like at home cooking and baking …like crazy. That’s it, basically. Because, at the end of the day, food is always something that makes you feel like at home even if you wake up on the other side of the globe. 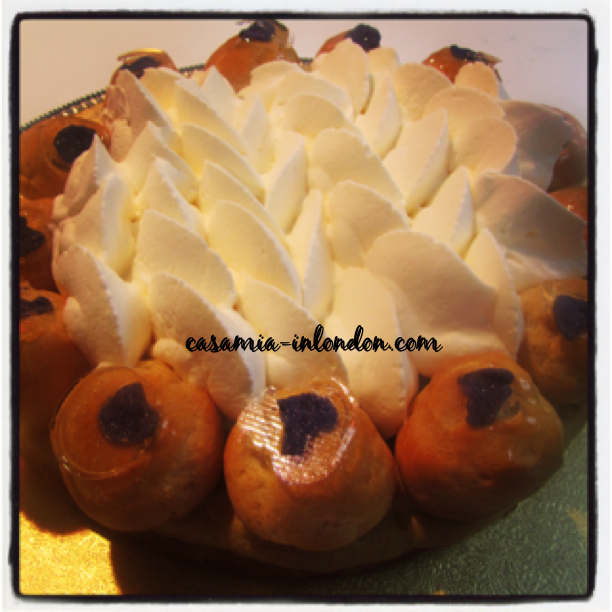 I find St Honoré the quintessential pâtisserie practice, it has almost all the basics in it. Pre heat the oven to 200°. 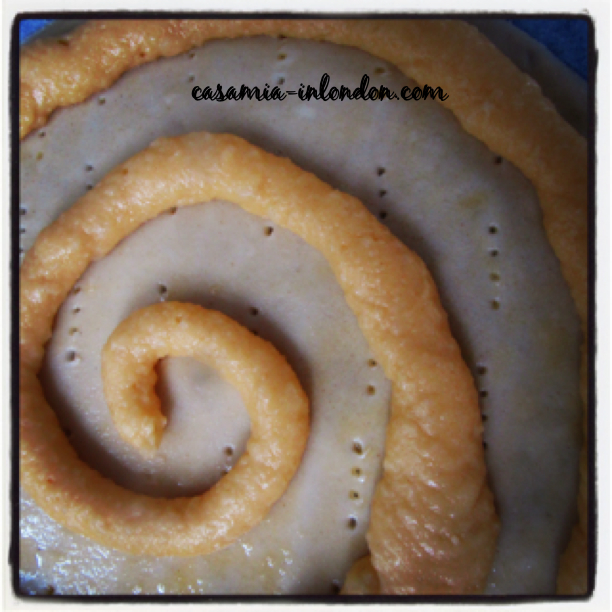 Roll the puff pastry 2mm thick, prick it with a docker or a fork and – using a 20 cm cake ring – cut a disc out of it. Line a tray with baking paper and lay the puff pastry on it. Cover it with cling film and put it aside. 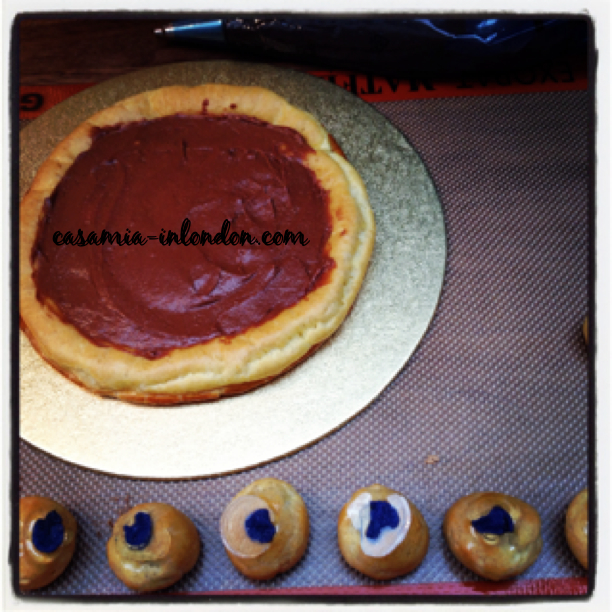 Then, proceed as in https://casamia-inlondon.com/2013/02/20/mini-chocolate-eclairs/ for your pâte à choux. Egg wash the puff pastry and then with the help of piping bag (plain tip n.8), pipe a little pâte à choux spiral around the edges of the puff pastry and a bit inside, as in the picture. Brush with egg wash the pâte à choux. then bake this base for 20 minutes at 180°. 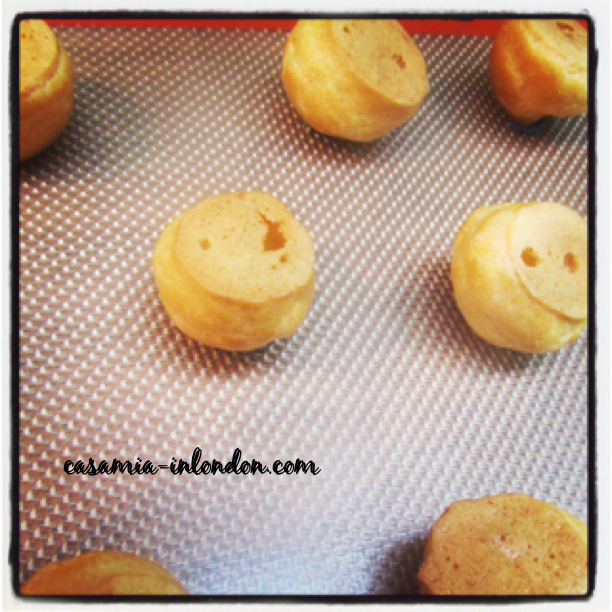 Use the left over of the pâte à choux to pipe your small rounded buns, you will need approximately 13/15 for the cake. Egg wash them and bake them at 200° for around 10 minutes. Then lower the oven to 160° to make them dry in the inside, for another 6/8 minutes. Once ready, let them cool down. In the meanwhile, prepare the pastry cream. For the method, have a look at https://casamia-inlondon.com/2013/05/01/millefeuillepastrycreamandchoc/. I have changed the quantities and I added the whipping cream to the milk because I figure I like it much lighter. Also, in this case – when I was ready to use to pastry cream – I melted the chocolate at ‘Bain-Marie’ and I added it to the pastry cream right before using it, to have a chocolate pastry cream. 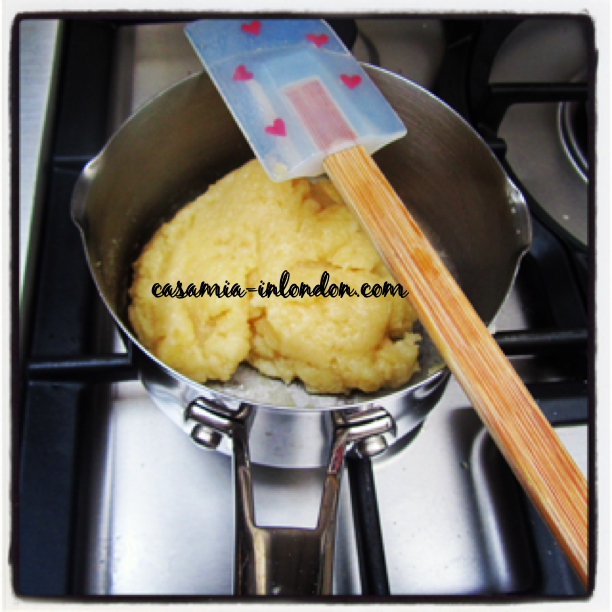 Use this cream to fill the buns and to fill the base of the cake, as in the picture, with the help of a spatula knife. Bring the sugar and water to a boil in a small saucepan over medium-heat. Cook this mixture until light caramel colour. If you have a thermometer, it has to reach 165°. Stop the cooking process by briefly dipping the base of the saucepan in ice water. Dip the top of the buns in the caramel and place the caramel-covered side down on a silicon mat. This is to give the nice flat appearance to the buns. I have also incorporated some nice violet crystalized petals to them, to make it nicer. To do so, just place the petals on the silicon mat and once the buns have been dipped in the caramel place them on the petals. In this way the petal is going to get stuck to the bun. Now, using the caramel as glue, stick the buns to the edges of the puff pastry disc. If you need to bring the caramel back to 165°, you can add some water to the saucepan and put it back on medium heat. 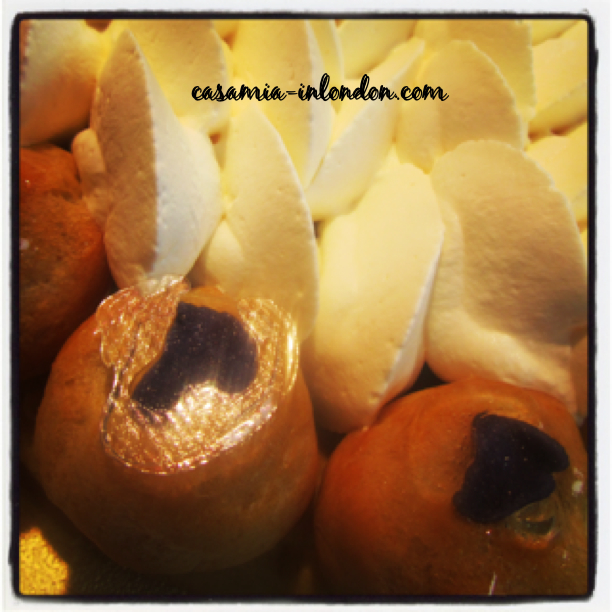 As final décor, whip the whipping cream with the icing sugar and with the help of a piping bag – St. Honoré tip – pipe the cream onto the centre of the cake and in between the choux pastry. Refrigerate the Saint Honoré until ready to serve.